In his first book, astute cultural critic Ralph Brauer (liberalamerican at ProgressiveHistorians) looks to reverse the trend against big government — specifically, the bigger the better to solve America’s cultural ills. Weighing in at a hefty $49.95 cover price (though you can get it on Amazon for less than $18), The Strange Death of Liberal America is not an easy read, but it’s an enlightening one. 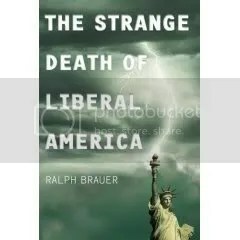 Brauer, the executive director of the Transforming Schools Consortium, aims his searching intellect at everything from Strom Thurmond to Martha Stewart, and weaves the whole into an overarching web of liberal malaise and political corruption that heralds the death, and suggests the resurrection, of American liberalism. Today Strom Thurmond stands naked before history, stripped bare by the revelation that he sired a daughter in an affair with a black maid. Like the South itself, this man who opposed Martin Luther King Day in part because of questions about King’s moral character, appears more complex than the myth he sought to sustain. So the life of Strom Thurmond becomes for many not unlike that Edgefield photograph [of Thurmond’s birthplace], a rutted dirt road shaded by peach blossoms. For half a century throwing bricks at Strom Thurmond has served as a particularly popular Yankee pastime. Yet the old saying about glass houses has never held so true. As much as I disagree with it, the [Southern] manifesto shows Thurmond’s ideas had a certain intellectual consistency. As states’ rights became antigovernment, as laissez faire and segregation again converged, what some viewed as regional prejudices and peculiarities were revealed as having deeper roots. In my own Minnesota community Confederate flags flew from the pickups of a racist gang calling itself the All-American Boys. Those peach blossoms, then, covered a great deal more than Strom Thurmond or the South. Today, some appear more than ready to scatter peach blossoms on the grave of Liberal America. From the beginning, I decided that unlike those of the Raucous Right who specialize in undocumented rumors, this book would empower readers by containing as many sources as possible that can be found on the Internet. This allows readers to make up their own minds. I should also add that as a person with a disability and without a research assistant, I could not have written this book without the Internet. This argument is all right as far as it goes; however, the Internet is not yet home to enough sources to round out such a far-reaching book as The Strange Death of Liberal America, and Brauer’s source material is necessarily limited by the choice. In some instances — particularly in the book’s best chapter, “Mrs. Hamer’s Question,” where Brauer utilizes the online records of the Mississippi State Sovereignty Commission with stunning success to paint a dark picture of Republican forces in the South — Brauer’s online fixation pays off. But in other chapters, his lack of recourse to printed sources simply does not appear to have allowed him to get to the bottom of the issues he discusses. This problem is especially evident in Brauer’s discussions of suburbia, which seem scattered and untethered to any true historical or contemporary documentation. His attempts to canonize such a cynical tool of corporate America as Martha Stewart, his somewhat overblown lament against online data-mining and niche marketing, and his lack of engagement with Lewis Mumford’s critique of Stepfordized suburbia (which he quotes, but strangely offers no opinion on) all gloss over what would appear to be the obvious point: the inherent evils of suburbia as a cultural and environmental force. Today’s urban and suburban planning, controlled and regimented in ways that its originators in the Progressive Era would find abhorrent, is not the natural outgrowth of the middle class’s stymied westering spirit, as Brauer would have it, but a wholly corporatized way of life, part and parcel of the same cynical and heavy-handed marketing forces that characterize virtually all of the corporate Right. While the battle between equality and inequality weaves through human history, its current manifestations should be our generational “fire bell in the night” — that ringing phrase Jefferson used to describe the impending Civil War over slavery. In the raging storms of our times, the word liberal has become a lightning rod attracting bolts of random, angry energy. In the flashes of light one sees troubling contemporary developments ranging from diminished voter participation to rising income inequities, and increasing media concentration. Such an interwoven web of causation may be an overreach, but not by much; and Brauer’s solutions to America’s myriad interrelated problems are spot-on — bigger government, increased civic engagement, and leadership that cares about the people’s welfare instead of about winning at all costs. For these reasons, and many more, The Strange Death of Liberal America is an important book, both as cultural artifact and impassioned historical paean. It’s an enlightening and highly-recommended read for lefties and historians alike. This entry was posted on Saturday, October 6th, 2007 at 8:33 pm and is filed under Uncategorized. You can follow any responses to this entry through the RSS 2.0 feed. Responses are currently closed, but you can trackback from your own site.